I'm starting a new Beastmen army and I've been sourcing units from a variety of locations to try out. I've found these minotaurs from Eureka Miniatures which I think are fantastic sculpts. However, I'm torn on how to base them. The options are three across or three front, two back. I know the more "crowded" base strikes a more traditional Warmaster feel that I like. But I almost wonder if it looks too squished and you can't appreciate the models any more. Pics are below, all feedback welcome!http://cloud.tapatalk.com/s/58bdf5e6df7a8/IMG_20170306_175709986.jpg? Crowded looks nice but that will be hellishly hard to paint! I'd go 3,with two in front and one in back, then reverse it for thenext stand. These will be done for Adepticon right? Hmmm. Not a bad idea Dave. I'll have to play around with that. And no, unfortunately not for Adepticon. I think the problem was that the Empire army wasn't quite motivating me enough to paint, whereas I'm excited to put this one together. I wish I'd looked into the models a few months earlier. It'll be competing for painting time with the Death Guard army I'm hoping to get together for NEAT. Stormwind, I would need to lose my mind to try and paint a base that cluttered! I was aiming to base and paint the front row, then paint and add on the second. The models have great clean details that would be a shame to waste! Other musings, can anyone offer insight to why Centigors are based and treated like infantry? With the exception of pursuing. I'm just curious for the fluff/reasoning for that. I've done mine in 3s. My best guess on the Centigors is so that they can enter forests (the realm of the beastmen). Dave - hmm. Makes sense. Wish they were true calvary but it is fluffy. Rodders - I'm going to try trimming the riders off of Orc Boar riders and using the boars to replace the wolves on Orc Chariots. I'm waiting on the chariots to show up, but once they do I'll post some pictures and my opinion on how I thought it worked out. Then I'm thinking on using the wolves as Chaos Hounds. Waste not, want not! And thanks for the tips on basing. Doesn't Bel (Polar Fox) do some boars without riders? I'm sure I've seen a photo somewhere. 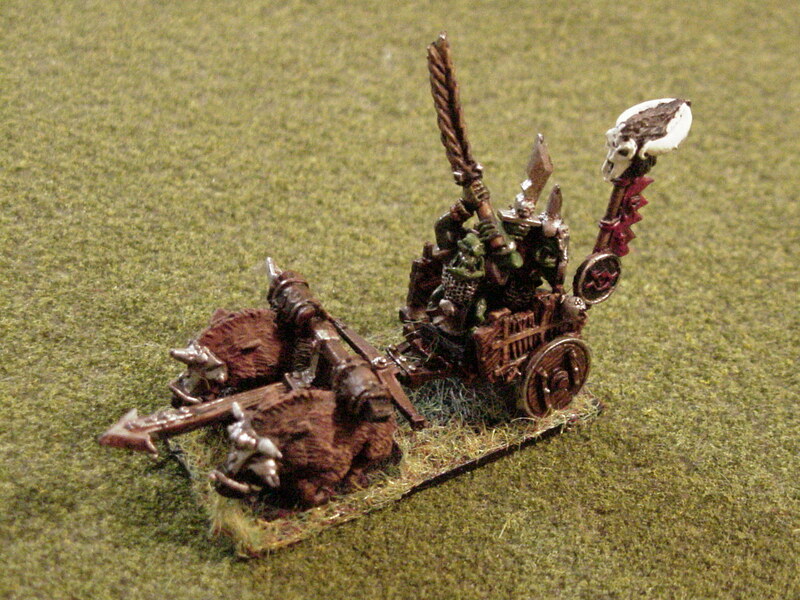 The Orc Command pack came with a Boar chariot. That'd work well enough I'd think. I saw boar riders, chariots with wolves, and solo wolves, but no riderless boars. May have missed them though. I remember see boars somewhere also, maybe pendraken. I'm not sure how they would scale. But since I haven't tried the kitbash yet, they could still be a possibility if this becomes too much of a headache. And I did see that orcs had the character chariot with a boar. One of the other Beastmen projects I found on a blog actually used that for a Beastmen character. Tracking down 12 of those to proxy the tuskgor chariots though seemed a lot when it was only one figure out of the pack. I figured it would be easier to kitbash some instead. These are loose and riderless. These are one to a base because they'll be proxying as Marauders. Hope this helps you to visualise. @empireaddict That's a beautiful army, thanks for sharing! I really liked your paint job especially. Small update on the army. Test pack of orc chariots showed up. Still waiting on the orc riders to finish them up, but here's what we have so far. The chariot rider is from Eureka's Orge Beast pack.